I still wonder whether he reads them aloud (sorry for sounding like a broken vinyl record about a Q for which there is no A). Can someone do a demographic of the population of this pew? There's 2 Minnes, 2 Pepyses, and Ashwell---making 4 ladies' outfits (were they wearing hoops that year?) that we know of. Was Minnes himself there too, one wonders? If Sam was the sole male in the flock one wonders at his reservations. I am wondering if in 2350 people would find life so boring in 2006 as I find it to be in 1662!!! "...and so home to supper and talk, and Ashwell is such good company that I think we shall be very lucky in her..."
Cut to shot of guillotine (provided by me via wormhole) operated by Bess slamming down on our befuddled Sam. "Talk? What? You can't talk to me? You never talk to me anymore. But in comes this teacher and you can't wait to sit and chat the night away." "Good company? What I am not good company? Maybe if you didn't always lock me away in this damned home I could be good company." Argument recycled through night. "You came home early because you wanted to talk to...Us? Uh-huh." Narrow look, utter silence for rest of night. "Oh...We are 'very lucky in her'? What a pity you couldn't have had the luck to marry her." Utter silence for the rest of the night. I think the pewfulness results from all the usual Naval personnell being there (Battens and Penns and Pepys and Minnes normal households)AND the visiting Minnes rellies (as we say down here). So the pew would be holding what? - 4 Penns, 4 Battens, 4 Pepys and 3 Minnes.A squash! Lady Batten and maid vs Bess and Ashwell...Two spots left in the pew. Sam, the Sir Wills, Sir John all watching eagerly. "wonderfully warm, dry calm weather a sweet seed time. I was busy. god command his blessing,, this day a windy shower, god good to us in manifold mercies, lord awaken my spirit to bless thy name." "This day the weather, which of late has been very hot and fair, turns very wet and cold, and all the church time this afternoon it thundered mightily." The weather in Sam's London seems to have been rougher -- or is it all in the eye of the beholder? "... and Ashwell is such good company that I think we shall be very lucky in her"
Isn't a new relationship a wonderful thing, full of optomism, as I know only too well. After a 30 year marriage, being jettisoned because of a girl met a yoga, what was once a lovely husband ruined with the "mid-life crisis", I too am learning the ropes of new relationships. Keep up the optomism Sam, it'll do you proud, and Elizabeth may do well out of your optimism! The most interesting year since Creation time! Socially, a lot of people going up in the social ladder. Politically, a new stable King and not the turmoil and insecurity of Cromwell's times. (Of course, we have to keep an eye on the Papysts). New inventions and discoveries made every day. There is always something new to learn concerning Geography (new continents!) Astronomy (new stars, comets, moons of other planets), Medicine (blood moves around, little animals to be seen under Hooke's microscope, anatomical discoveries to be seen at the theater). Medicine so much progressed that it is almost 40 years from the last big epidemic and we probably got rid of the Plague epidemics for good! Technologies: that permit to sail almost into the wind. Ships bigger and stronger. Excelent maps, etc. I am wondering whether they knew already that it's the cold front coming in upon the "hot and fair" atmosphere which condenses out the moisture and leads to the wet and cold weather with thunderings. Exactly what we experienced here last week, by the way. It's days like this, that I and most likely others enjoy how easily we can (or think we can) empathize despite the hundreds of years and whatever other gulfs that lay between. Ruben, in retrospect the era was exciting; I was referring to Pepys in particular; his routine does not seem exciting and besides he is denying himself the theater and wine. His Wealths encrease encreaseth his desires." JWB, thanks for the link - wonderful site! Yes, Dirk, the weather varies as to the beholder! Obviously Sam is exagerating when he says its very hot. It doesnt get 'hot' in March. There must have been a nice , warm, spring-like spell of weather(the like of which we are all praying for in the UK at present after this cold start to spring). As my postings have noted(eg see 29Nov1662) it was cold enough for the (slower-flowing) Thames to freeze over in 1662/3 and the 'warm' spell must have been a relief to London(especially the poor). This ended in dramatic fashion as a cold front(or similar) swept in over Essex(Josellin) and London, probably from the northeast. Sudden temperature contrasts can bring thunder at any time of year. Pepys wouldnt have known about cold fronts, only weather-lore(ie 'the north wind doth blow....). Crude thermometers were invented in the late 16th century and were being used by Pepys's contemporarys(ie Robert Boyle). It wasnt until after The Met Office was founded in 1854(by Fiztroy) that weather observations were 'co-ordinated' in an effort to understand what's going on with the weather and climate(and it's still going on). The concept of cold fronts was developed by the Norwegian scientist Bjorknes around 1920, and this turned out to be an over-simplification of reality as can be seen by an experienced eye on satellite pictures. Rev Josellin and Pepys experienced different degrees of the same weather feature on the same day. 'Weather' must have been a pleasant surprise in 1662/3, another reason for 15TH MARCH 1662 NOT to be a boring day! I have a complete set of the diaries and while not admitting to have read every page, i must say i have never found one boring day so far. Ah, A.D.A., you need an Ashwell to add interest! I don't suppose the same pews are still in St. Olave's for someone to go have a look and do the math? In 1664 all will be back to "normal" though. Being in London today I managed to get into St Olaves even though it is temporarily closed. The pews have 12 cuscions on them - but looks a bit tight with seventeenth century clothing. Good for Giovanna. Do they look like 17th century pews or are they perhaps later replacements? Answering my own question, I see that Wikipedia states that the present church is largely the result of post-WWII restoration, as much of the original was destroyed during the Blitz. Present pews therefore likely to be replacements, though they may, of course, have been made to approximately the original pattern. Thanks to Giovanna and Mary for undertaking to answer a question I thought fated to be rhetorical. As Sam says, if everyone shows up, adjustments must be made. And don't forget the men's hats. The Navy Office sat in a gallery pew. That is why the Elizabeth Pepys memorial is so high up the wall - it was actually close to where Sam would have sat. The gallery has long been pulled down so we have no way of knowing how large it was. Galleries used to be common in churches, but few remain. Good example in St Mary's Whitby, N. Yorks. Despite long trawling, this is the only picture I could find of the inside of St Mary's, but it does show the galleries, sort of. Box pews with a door (where worshippers sat round the sides facing inward) used to be the norm, as at one church in Whitby, but were usually replaced later by the bench style. "Most English parish churches had no formal seating arrangements until the late 17th century. Prior to this, the congregation either stood, sat or knelt on the hard mud, sand or stone floors or leant against the outside walls or pillars. Services included stories from the bible, the reading of psalms, and prayers but little formal "music". Sermons or talks were very short. "After Charles I was executed, the Puritans' concept of lengthy teaching sermons soon helped speed up the introduction of seating! Families began to bring their own benches or chairs and group them together. This became more formalised with the introduction of enclosures known as "sittings". In order to better keep the family together, the designs were as a box - hence the term "box" pew. 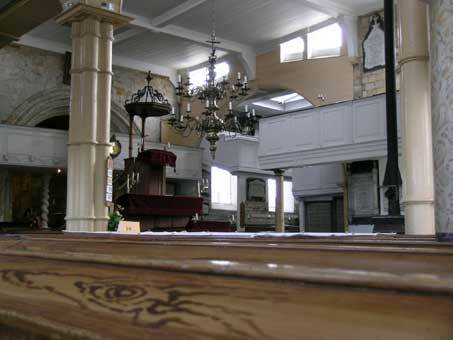 These private pews were normally rented or bought by families and so only those with sufficient substance in the community were able to afford them. The larger and more wealthy families had the larger, more ornate, box pews, and these were always in the best positions in church. In these early schemes there were no standard designs so a church would be filled with different shapes, different heights and frequently different materials. As many private pews were lockable, churches appointed official "pew openers"! There were few church organs or formal music and rarely choirs and so the chancel area was also usually rented out and filled with box pews; the families having to face the pulpit with their backs to the altar! "Poorer families, who were unable to buy or rent box pews, stood in the aisles or against the back or side walls of the church, or in a gallery. Not all box pews had seats and some churches installed special enclosures for the poor with sloping rails along the rear against which to rest, but not sit. Examples of various types of box pew can be seen in St Mary's Church at Whitby in Yorkshire. "Private box pews allowed families to sit together in one place and frequently younger children would sit on a rug on the floor and read or play quiet games during the service without causing too much distraction to other members of the congregation. As box pews were rarely uniform in style or size, the interior of the church would have looked extremely untidy with different sizes, styles, paint colours and shapes of pew. Considering how often Sam chooses to attend other churches, I think he's being a bit snooty about there not being enough space in the Navy Pew. It's another opportunity for him to instigate a bureaucratic office sign-up list. I also wonder if Wayneman and Jane and Will and Sarah also had to attend this church? I'm sure they were banished to stand at the back. Can someone do a demographic of the population of this pew? There's 2 Minnes, 2 Pepyses, and Ashwell---making 4 ladies' outfits (were they wearing hoops that year?) that we know of. Hoop skirts did not come in until the 1800s, so if the pew was crowded it wasn't because of voluminous skirts. Perhaps hyperinflated egos were the problem. They have always been present in any social gathering, probably since the dawn if man. The word "snooty" did not exist in Sam's day*, nor would the concept have been understood by him or his circle. The nearest word to it that Sam uses in the diary is "high", often when describing bishops' behaviour. The bishops were trying to reassert their ascendancy and authority in society and were generally resented for their pride and arrogance, even by conforming members of the Church of England. The ascendancy of Puritanism had influenced the mindset of society as a whole, including loyal members of the Cavalier Parliament. In general, people knew and accepted their place, even if they were trying to better their social position. Some egalitarian ideas had undoubtedly taken root in the fringes of society: the legacy of the Levellers continued to influence the more educated working class though the rise of Chartism and beyond. And religious Nonconformists tended more to social nonconformism too. The Quakers in Sam's time were thought quite extreme for refusing to remove their hats in front of their social superiors. This may sound petty or quaint now, but it caused widespread outrage at the time. The subsequent influence of Quakers on British society was vast, and out of all proportion to their tiny numbers. *The word has no entry in the 13 volume Oxford English dictionary, nor in my 1973 version of the two volume Shorter OED on historical principles, except in the addenda, where it is defined as "superciliously contemptuous", and dated to 1919. BTW, even the word "snob" did not acquire its modern social meaning until the mid-nineteenth century. This is important, because, as Orwell pointed out in '1984', it is very difficult to think about an idea if the language to describe it does not exist, hence Newspeak. To go back to the logistics of sitting in church. Until the Toleration Act of 1689, weekly attendance at Anglican worship was, in principle, compulsory for everyone. Pews were, and sometimes still are, privately owned seats in a church belonging to those who sponsored them, and their descendants. The Navy Board owned, and under Sam's direction, had recently improved some pews in St Olave's, their local church situated next to the offices and residences of its members. Those entitled to sit in them would have been members of the Navy Board, their families, and guests. This would have normally comprised Sir John M as Comptroller, Both Sir Williams, and Pepys. Others of the Navy board, like Carteret and Coventry, would have had the right too, but were unlikely to exercise it as they lived elsewhere. At the moment, Sir William Penn's wife was managing his estates in Ireland, and Penn was on his own (with servants) The domestic servants would not expect to use the pews, and *in those times* it would have been unthinkable for any master to allow it. Will Hewer and Miss Ashwell were not classed with the servants and would have expected to sit with, or in front of, their employers. Wayneman might have been expected to stand or squat in the aisle next to his master. All this may seem strange or even alien to the modern mind, but it was not trivial in Sam's day. Those who get some satisfaction from snide judgement of those who have been dead for three centuries should at least do so by the standards of the seventeenth century, and not the standards of today, which those judged would not even understand. So when SP visited other churches, where did he sit? Or did he stand in the aisle with poor people? ’pew, n.1 < Old French puie . . 1.a. In a church: a place where seating, often enclosed, is reserved for the use of a particular (often distinguished) worshipper or group of worshippers; (more generally) any enclosure or compartment in which worshippers may be seated. Also in extended use. ‘snooty, adj. < snoot n. Supercilious, haughty, conceited; affecting superiority, snobbish; ‘highbrow’, ‘stuck-up’. Occas., irritable, short-tempered. 1919 A. Huxley Let. 12 Aug. (1969) 180 A very snooty cousin and a sporty one. ‘snoot, n. < dial. var. snout n.1 1. = snout n.1 2. dial. and slang.